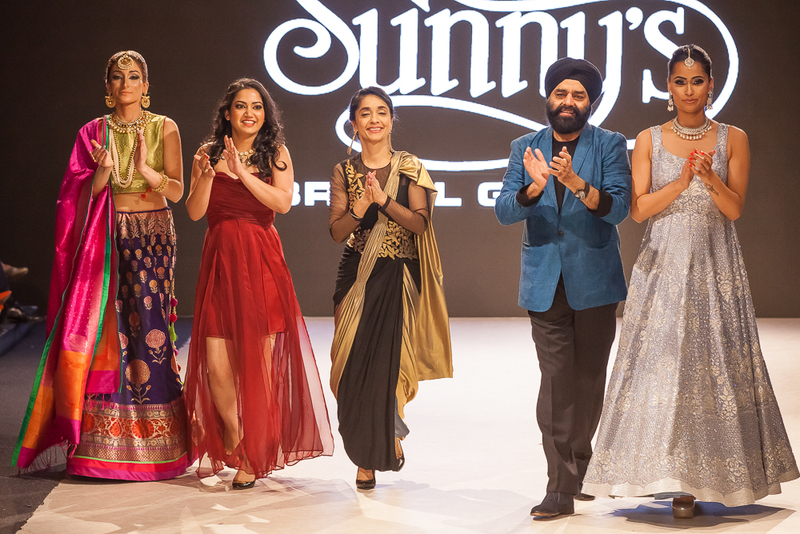 The closing show on Saturday night was by Sunny's Bridal and I can't imagine a better show to end the evening. It was full of glamour, excitement, colour, sparkle, fabulous models and high energy. However, as I was in the audience for their last show on the runway at Vancouver Fashion Week in March 2015 (review HERE), I already knew that I was in for something special. "IF YOU DON’T STAND FOR SOMETHING, YOU WILL FALL FOR ANYTHING. STAND IN STYLE.” This season Sunny's Bridal will be presenting 25 women's contemporary bridal pieces for evening wear. Our inspiration behind this season' collection comes from our client's desire for bridal pieces ideal for destination weddings. The collection will consist of elegant pieces with neutral + pastel colours in uses of light gold and silver embroideries. 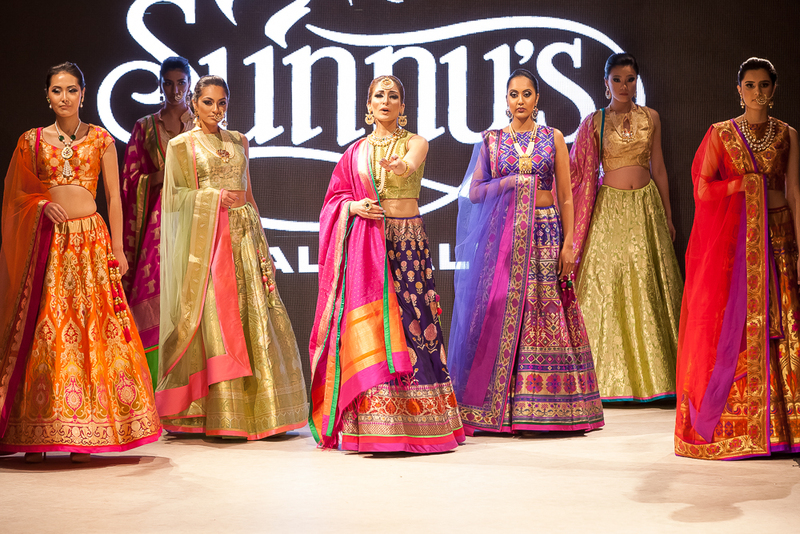 In an effort to revive "the lost glory" of Banarasi fabrics, Sunny's Bridal show will open with hand-woven pieces in exquisite colours. We are excited to revive the Banarasi weaves in line with today's modern consumer." This show popped right from the moment Toor, along with six gorgeous models. stepped onto the runway in an opening pose. Starting with strong, vibrant, high energy, brightly coloured looks really made everyone sit up in their seats, not easy after a long day of watching shows. Then the lovely and talented Mesha Toor offered her own unique mix of style and subtle dance accents, taking her time as she glided down the runway. Each movement an offering to the audience. It set the stage perfectly for what was to follow. What photographs can't convey is the amazing energy this show had, the way these beautiful garments sparkled in the spotlights and the enthusiastic and very vocal response from the appreciative audience. It was a hit from first look to final bows. Kudos to all involved in this show!!! If you want to know more or to contact Sunny's Bridal, please go to the website at http://www.sunnysbridal.com/2014/.